Well located next to open countryside on the edge of this popular residential area with good local facilities an ideal family property providing manageable four bedroom accommodation with two reception rooms, well finished and double garage. Hall: - An open hallway with panelled entrance door, staircase to the first floor, radiator and cloaks cupboard. Wc/Cloaks: - Having WC, wash hand basin on vanity unit and radiator. Conservatory: - 9'2'' x 9'6'' (2.79m x 2.90m) - A modern style double glazed conservatory with double doors opening to the rear. Dining Room: - 10'7'' x 9'2'' (3.23m x 2.79m) - Providing a separate dining area with windows to the front and side and radiator. 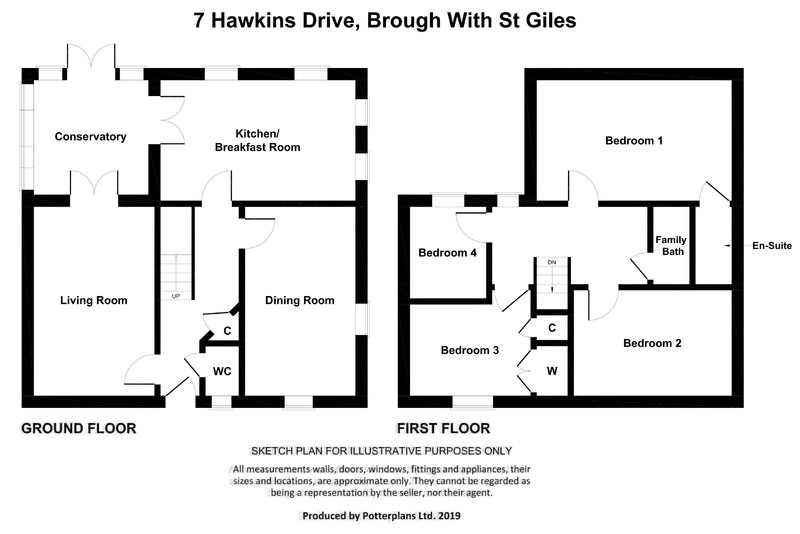 Kitchen: - 14'1'' x 16'2'' (4.29m x 4.93m) - Well fitted with a comprehensive range of modern units in beech finish with worksurfaces, sink unit, tiled surrounds, plumbing points, power points, radiator, understairs cupboard, breakfast area and window to the rear. Landing: - With ornate leaded rear window. Bathroom/Wc: - 5'9'' x 6'7'' (1.75m x 2.01m) - Having panelled bath with shower above, wash hand basin on vanity unit, WC and radiator. En-Suite Shower Room/Wc: - Having tiled shower cubicle, wash hand basin on vanity unit, WC and radiator. Bedroom 2: - 12'11'' x 8'9'' (3.94m x 2.67m) - To the front of the property and with radiator. Bedroom 3: - 9'2'' x 9'11'' (2.79m x 3.02m) - A further bedroom again to the front with built in wardrobes and radiator. Bedroom 4: - 6'10'' x 6'4'' (2.08m x 1.93m) - A good sized single bedroom to the rear and with radiator. Double Garage: - With lights, power points, plumbing points, water point and personal door to the side. Gardens: - Lawned gardens to the front with shrubbery borders and neat fencing. Driveway to the side with ample additional hardstanding. South-facing raised lawned gardens with paved terrace, neat fencing and personal gate to the side.